One of adidas’ most noteworthy exploits is its ability to take design cues from its storied past and turn them into modernized creations that seamlessly fit into today’s sneaker climate. The Three Stripe’s EQT series is no better example of that, drawing inspiration from its Equipment line from the 90s. Next up to join the hybridized adidas family is the EQT Support 91/18 that harkens back to the chunky EQT Support 1991. Giving it a modern day twist, adidas has significantly slimmed down the runner while amplifying the the amount of mesh on its upper to increase flexibility and comfort. Finishing off the technological renovations is a full-length BOOST midsole unit that will intrigue a newer generation of the Trefoil Brand’s supporters. In recent years, the brand has had a propensity for adding categorical information to the outside of its models, and that continues with 91/18 noticeably planted atop its forefoot. Finally, it will borrow an original color scheme from the Support 91, that sees its branding dressed in a striking green, with grey, black, and white providing neutral contrast. 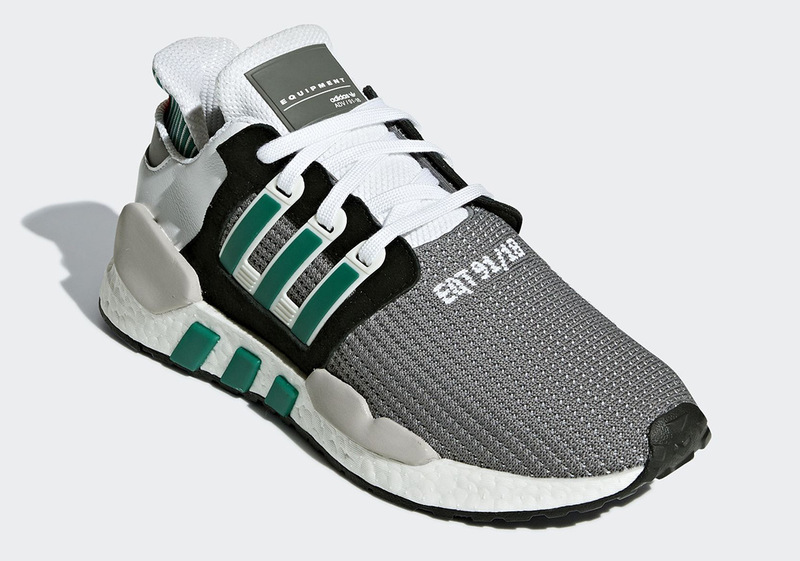 Enjoy an official look at the newest entrant into the EQT Support line below and look forward to its ensuing release on adidas.com September 1st.